You know that my girls love clothes, and most days they love to match. 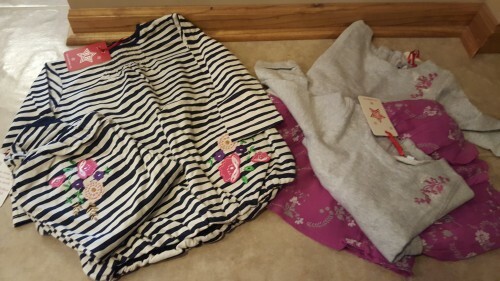 I was so excited to see these adorable clothing items from Rockin’ Baby as well as learn the great story behind the company. This company has a great heart for charity behind them. They like to give and to help and if you are purchasing some of their slings, pouches, or clothing items, they know you do too. Every sling, pouch, or clothing item you buy they will donate an item to mothers in desperate need in Haiti or Kenya. They will do this through well managed, non profit organizations who are committed to helping these mothers living in terrible conditions. They call this their “Mother to Mother” mission. When they started “Mother to Mother” in 2011 they wanted to make a real difference in the world and with your help, they really have. Rockin’ Baby used to just be a company known as the the sling and pouch company that donates a new sling to every mother in need for every sling purchased, and they just launched their first children’s apparel collection that is also a one-for-one concept: You buy. We give. One-for-one. For every item of clothing sold across all designs from the new Rockin’ Baby collection, an item from the Hero range will be gifted to an Ebola orphan, providing vital clothing for a child in need. The project is known as Child to Child and it will be carried out in partnership with Child Fund International. We are all big game players in my family. As we have had children it has been tricky for us to find games that can include our young children, but are still fun for the adults. I must say that I have not ever found a game that I was not 100% satisfied with from the Wonder Forge game family. They have such great games for all the kids in your family, that adults enjoy playing as well. In 2007, Jacobe Chrisman (Founder & CEO) and a small group of creative types with a passion for children’s entertainment came together to develop extraordinarily fun, original play experiences for kids and families. Since it was originally launched, Wonder Forge has always offered top-quality experiences, raising the bar for preschool and family games everywhere. The preschool games help to celebrate the “can do” attitude in all kids – engaging them physically, socially, and creatively. The family games bridge generation gaps and create wholesome family moments and lasting memories. Wonder Forge additionally always works to create strong, long-lasting partnerships with licensors. This is wonderful when your children love certain characters. Today, Wonder Forge makes over 85 games that have won more than 160 top awards for product excellence. They are sold nationwide and in over 11 countries. 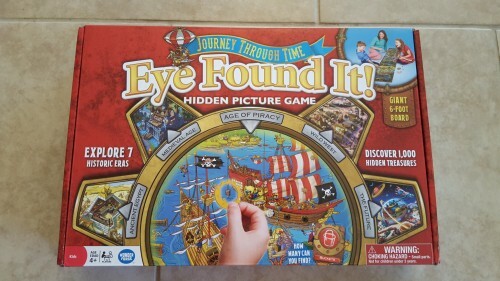 In this wonderful game, you work together as a team of historians, scientists, and adventurers solving the world’s greatest mysteries with the Eye Found It Journey Through Time Hidden Picture Game from Wonder Forge. You can venture and find hidden objects throughout time from the Prehistoric Era to the Present Day. You want to Race to the end of the giant 6-foot game board before your Timecraft runs out of fuel. This game is recommended for ages 4 and up. My Thoughts: This game was a great deal of fun. I had a lot of fun playing this game with my daughters. I also have to admit that this is one of my husband’s favorite games that we have played with the girls as well. My daughters are ages 3 and 5 and so they definitely were both able to understand and play the game really well. I’ll get you Red Baron! The world’s most beloved beagle is back! 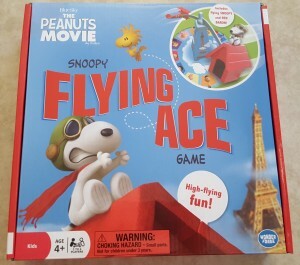 A legend in his own mind, Snoopy takes off as the Flying Ace in constant pursuit of his nemesis, the Red Baron. Flip cards and race to make matches before Snoopy spins to a stop. It’s high-flying family fun! This is a great game for children age 3-10 years old. Everyone knows that my girls are definitely all girl. They love anything pink and all the babies that you can possibly find. 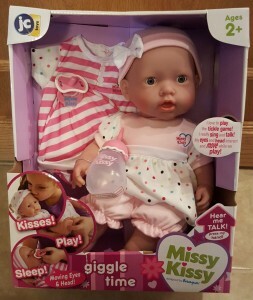 Missy Kissy did not disappoint the girls in my house. JC Toys Group, INC is the worldwide designer and manufacturer of a wide range of collectible dolls, specialty play items and play dolls and accessories. They were established in 1993, JC Toys is a family run and operated business that has continued to grow its product line to include many doll categories. Each doll and doll accessory is carefully designed to ensure that the end user is 100% happy. Our goal is to make all of our dolls loveable and to ensure that everyone from a first time baby doll mommy to the most demanding doll collector are completely overjoyed with our quality and superior design. JC Toys Group, Inc. dolls were first introduced to the US Market in the early 1980’s. At this time the company and product was known by the popular name BERJUSA. These dolls had sizeable impact on the doll market because of their innovative life-like features and adorable, gentle facial sculpts. As you all know, Kidz Bop is one of my favorite companies in the world! My girls and my students absolutely love Kidz Bop. 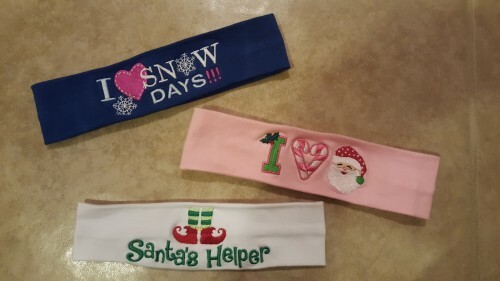 There are a ton of great stocking stuffers as options for your child from Kidz Bop to keep your child happy through the holiday season. Kidz Bop records kid-friendly versions of today’s biggest pop music hits. They release two major numbered albums each year. They also release a themed album in the spring. Who sings on the Kidz Bop albums? 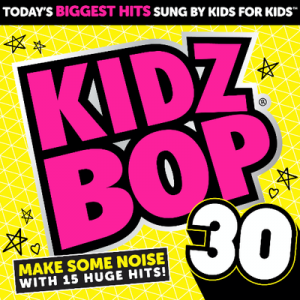 The Kidz Bop kids sing on the kidz bop albums. For four consecutive years (2010-2013), Billboard magazine has named the Kidz Bop Kids the “#1 Kids Artists” in the U.S. ! Who are the Kidz Bop Kids and how does Kidz Bop cast the group? Meet the new Kidz Bop kids – Ashlynn, Bredia, Grant, Jayna, and Matt! Kidz Bop recently held a nationwide casting call to find a new group of talented young performers to sing on the Kidz Bop albums, star in TV commercials & music videos and travel North America as part of the Kidz Bop Kids live tour. Thousands of kids across the country try out and only 5 are picked.